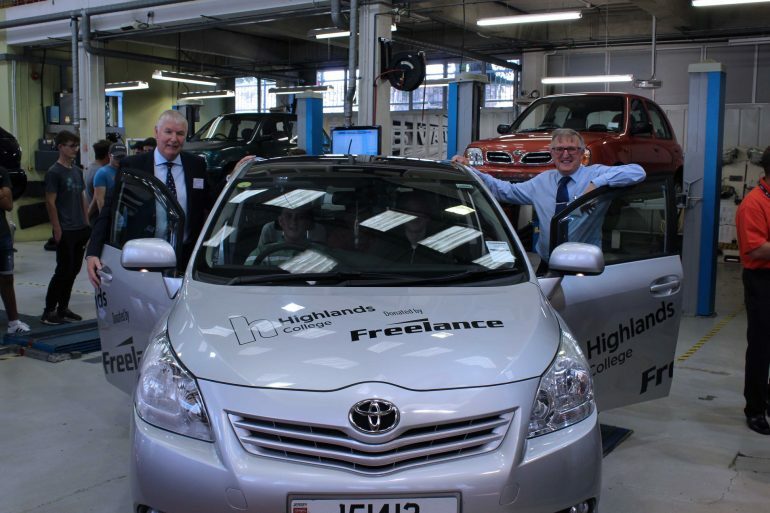 Freelance Jersey has given Highlands College a Toyota Verso T-Spirit to support students in their practical studies. The car was unveiled at Highlands College Automotive department on Tuesday 26 June. The car will be part of our teaching resources that allows students the practical experience of working with the latest automotive technology. Martin Gurren, Freelance Managing Director, said: ‘Highlands College prepares students with the right skills for future employment and that means working with the latest, high-tech cars. Some of these students will be our mechanics a few years from now so this car is also a way of Freelance investing in our own future service offering to clients. ‘Our intention is to further our work with Highlands and their students to include Freelance mechanics team giving talks about hybrid technology changes. This is all about delivering service excellence to clients and we see this as an opportunity to add value to their curriculum in addition to the practical experience’. Steve Lewis, Principal of Highlands College, said: ‘This generous gift is one part of a wider engagement we have with the Freelance team. Our courses are specifically designed to prepare students for the reality of working life so access to cars is essential. The automotive sector is a fast-evolving area of specialisation which means we have to be able to offer a practical curriculum and that includes knowledge of developments in the latest automotive tech. With Freelance as partners we feel confident our students will leave us trained to the highest degree and ready for work’.